Do you have questions about the remote codes above for a Samsung TV? Please leave a comment below if you need other remote codes for your universal remote. We just bought a Samsung 4Lk Smart tv 43″ from Best Buy Ontario Canada. Just can’t get my Bell Fibe tv remote to turn it on and off. Samsung PLANO Picture tube TV how reset the TV with using the remote. I am looking for a code to allow my Samsung blu-ray remote (model bd-h8500a), to be used to also operate my Hisense 55 inch smart tv (model 55n4). Have Samsung Flat screen TV model T32E310EX 32 inch LED TV and cannot find the 4 digit code to activate my Big Button Remote Control Model A11GT from Maplin. Maplin Tech Support didn’t help. I have an older Samsung tv/vcr combo (yes a vcr) and am trying to set up with a new Sony DVD remote that will operate tv power, volume and input with correct code. MY SAMSUNG TV CONTROL IS NOT WORKING… CAN I USE A UNIVERSAL CONTROL ON MY TV OR DO I HAVE TO BUY SAMSUNG REMOTE? I have a Samsung TV and a Samsung remote control. The remote control does not affect the TV? The batteries work as I see the light under the remote control keys light up when I press the keys. I have tried the suggestion of pressing each key for 3 seconds and still not affect. Please let me know if I need to purchase a new remote control? The one I have worked for about two weeks and then stopped working. I appreciate all advice / suggestions. Hi, i’m running out of tv codes to try. I want my Samsung smt-c7140 setopbox remote to connect to my new Samsung ue40j5200aw. I have a Samsung 50″ plasma (PN50B550T2F) and a GE Universal remote. I’ve followed the instructions in the manual and gone through the list at least 5 times. I have a Samsung TV model number LE32A457C1D and would like the code number. Can anyone help please? Trying to send Samsung remote signals via cable to TV. For auto remote use. Built a interface of an infra red detector via two transistor stages so that its in the same sequence. Remote works tv OK but not via the interface unit though the output is identical in code etc to an IR LED used as the transmitter. The only noticeable difference is the “colour’ as viewed by a cct camera is that the remote is of lighter blue. I have a vivitar universal remote control and I had program MY Samsung tv, but it stopped working out of nowhere…. and I can’t find my codes guide book. I have a Samsung TV model UN32EH4003F. I have tried all the remote codes on this page. Can you please help. I am trying to set up a Directv RC73 remote. I was able to set up my Sony TV with another RC73 with no problems. Looking for the remote control code for the new digital box that Time Warner now requires. Digital Box Model DTA271HD – Samsung only has codes for the DTB261HD which does not work for my model. – Make sure that the DTA is powered on and properly installed. – Be sure your remote is able to see the front of the Adapter during setup. – Using your Adapter’s remote, press and hold the PROG button until the LED on the remote turns on, then press the INFO button. – The LED on the remote will blink slowly to show that it is now in pairing mode. – Enter the 3-digit number that appears on your TV screen with the keys on your remote. – If the numbers are entered correctly, then your TV will show Success. – If the numbers are not entered correctly, your TV will show Sorry, the entry was incorrect. – You can try again by entering the displayed code. – Press and hold “PROG” button for few seconds. – You will see a red solid light. – Release “PROG” button and then press “TV” key one time, do not keep pressed. – The LED light will go off after the correct code is entered. I have Samsung TV model UE40EH50000KXXU VERSION 01 S-N Z9DP3SLC400377H… I have just got new BT Youview box, but remote won’t link with the code they say in the book.. There are so many codes, can you let me know which ones are most likely to work please. If you are trying to use the remote from the BT Youview box to control your Samsung, try 4483 for the code. Let us know if this works. Or if your question was vice-versa. Looking for a five digit remote code for a Samsung TV, model number UN32J4000AF so I can program my Directive TV universal remote. I have tried codes 10812, 10814, and 11959, all suggested by the Direct TV code site. Anybody out there who can help me with pairing a Samsung UN75F8000 to a Bose Cinemate 15? I keep trying codes to pair the Bose remote to the TV but not luck as of yet. Any help would be appreciated. I have an Invoca Device and for some reason I cannot program program it and it is a three digit device. Is this the Invoca remote you are using? It is voice activated? Need code for cox contour remote that will work on my Samsung un48b6500 smart TV. I enter a code that works for the most part but won’t let me do a factory reset on my Samsung using the numbers. Trying to use service code: mute,1,8,2, power. When I try it nothing happens. Do u know of any other way I can factory reset TV? NO codes were working and I tried your list. Finally got it! I need a 5 digit code for my Bose CineMate GS Series II remote to control a Samsung SAT box SMT-S5140. Anyone? I have a Samsung LE40A456C2DXXU and quite an old Commtel Control Freak (4 in1) does anyone know if this RC is compatable with this model and if so, would you happen to know the code? I have a Samsung hw-j370 sound bar. I am looking for a 5 digit code for my universal remote. My husband and daughter do not have smart phones to use instead of the remote. The remote codes 32609 and 22609 should both work for your Samsung Sound Bar. My remote Control for Samsung LE26R51B does not work anymore. I want to use a Universal remote Control but what 4 digit code should I use? Do you have the code for LCD Samsung TV (lE32A457C1D)? The universal remote is a digivolt plus. 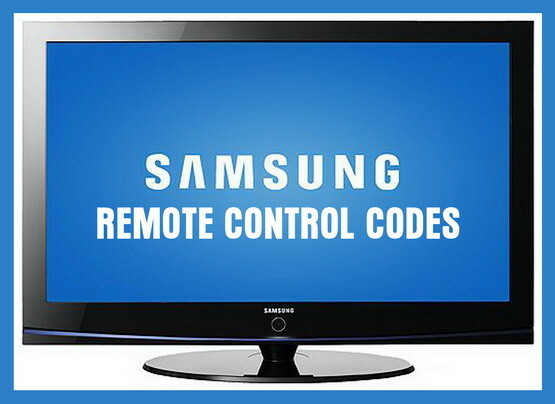 Try the Samsung remote codes on this page. Have you not tried them all? I have a Samsung DVD player. Can you tell me which code I’ll use for my universal remote control? Many thanks! You can find Samsung DVD player remote codes here. We have a Samsung tv that we are wanting to program a universal remote to.. we follow the directions on the remote and it turn the TV off like it recognized the programming but then it doesn’t work to turn it back on or any other functions.. can anyone help? You are programming the remote correctly if the TV turns OFF… you simply need to use a different remote code for your Samsung TV. only lists codes for vcr/dvd/ etc. It doesn’t given the code for the tv itself. Thanks for your assistance. The instructions also say enter the 3 digit code, all the codes I’ve located so far have been 4 digit codes, so a little confusing. Try using some of the 3 digit codes listed on this page. Turned out to be 101 so your third number worked! Thanks so much. Maybe I enter them wrong? I have to hold the TV/AV system Power button (red led light is on) and same time enter the codes, yes? Yes hold the TV/AV, red light should come on, release TV/AV, then enter remote code. I have a MZ19FSSS Samsung TV/monitor that I am trying to find a remote code for. I am using a DTX9950 DTV converter box and wish to use one remote. Can you assist? Do you know how many digit code you need? Does it say in your manual or have you tried other certain digit codes? it looks a 3 digit code and the manual gave me numbers that did not work. I’ve put in about 1000 different codes that dont work. Most likely you need a 4 digit code…. Could use the remote code for the Samsung BD-J5700 Blu-ray Disc Player. Using the Samsung remote control that came with my Samsung LN-T5271F. 52-inch HDTV. I have a Samsung TV in the kitchen and just purchased another Samsung TV for the living room. When I set up the new TV I find my living room remote turns on/off the kitchen TV, changes channels, changes sound etc. How do I get each of the remote controls to work only with the TV it came with? Are the Samsung TV’s the exact same model? There is not an electronic method to fix this problem. It is even acknowledged by Samsung technicians. Its a common issue and the only solutions we have seen are by covering or altering the physical receiver. Another one involves getting a different remote with a base station and connecting that to the IR sensors on the TV. I can’t find my 4 digit code for Samsung LE40C530. Can anyone help please?